How old is your father now, or how old would he be if he had lived? Divide this number by 4 and round the number off to a whole number. This is your “roulette number.” Use your pedigree charts or your family tree genealogy software program to find the person with that number in your ahnentafel. Who is that person? Tell us three facts about that person with the “roulette number.” Write about it in a blog post on your own blog, in a Facebook note or comment, or as a comment on this blog post. If you do not have a person’s name for your “roulette number” then spin the wheel again – pick your mother, or yourself, a favorite aunt or cousin, or even your children! My father is 71 so my ahnentafel roulette number rounded up is 18. My number 18 is John Wesley Reddick. 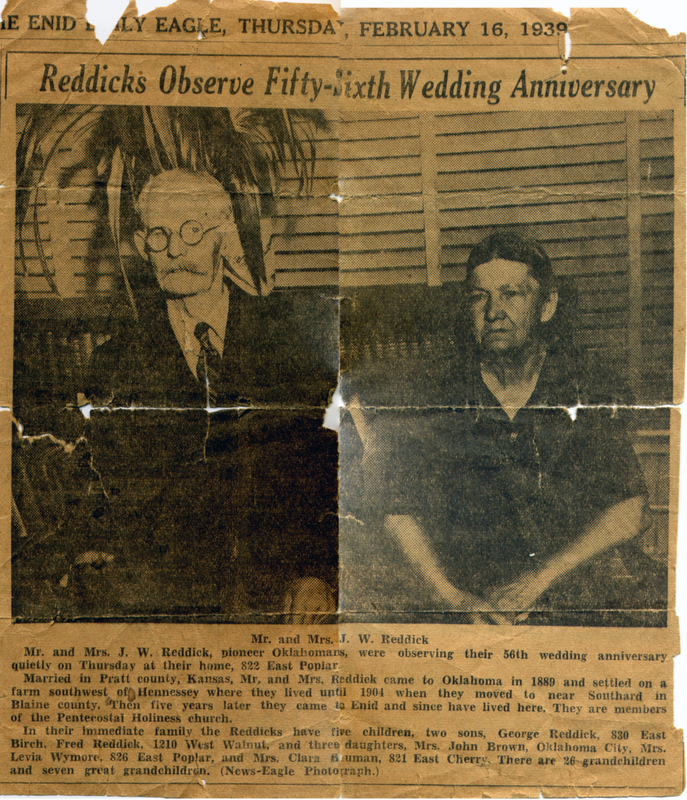 Just a few weeks ago, I visited with my 1st cousin once removed, Bill, and his wife Linda and they have a newspaper clipping of John and Lydia Reddick’s 56th wedding anniversary in 1939. The clipping is in pieces and falling apart, I was able to scan it and am including it here. Bill and my father were one of the 7 great grandchildren mentioned in the article so they knew their great grandparents, Bill said that he never saw Lydia smile but John smiled easily. That newspaper clipping is a genealogical goldmine, isn’t it? What a treasure! Yes, it provides information about when they arrived in Oklahoma that I did not know. That’s cool. I love discovering what all you have put together. I missed the Saturday Night Fun; I just looked at mine – it would have been my 26th, which is Thomas Harmon. You do have enough to have three facts about him: (1) his wife’s name was Delilah Davis, (2) they married in August of 1838 and (3) they had 12 children we’ve identified so far. You also had a birth date for a first child that is two years prior to the marriage – which could perhaps indicate a previous marriage, an inaccurate birth date, an inaccurate marriage date (which is very specific to be in error – though it happens) or just an illegitimate child – who knows? John, My great grandmother was Ella who was Fred’s sister. Since the time I posted this photo and newspaper clipping I have some better photos of them.